GM, is it really devastating? GM manufacturing has been leaving canada for years. As i stated in earlier posts, oshawa has lost 18,000 auto jobs over the past few years, so why now are they crying over the last 1,700? Unifor state that they are prepared to fight... please talk some sense. Gm canada has approximately 30,000 retirees and each may be entitled to receive up to $1,000 a month from the Ontario government, if gm defaults on their pension plan obligations. Rumours were flying wild, that gm was given the bail out money on the condition that they left the PBGF program, and I honestly don't know if we have. Years ago, Gm canada was allowed to stop ALL funding to their pension plan, which resulted in a multi BILLION dollar deficit. Gm was then given 5 years to top up of the pension plan. Gm's response... that's not going to happen. So gm was then given 10 years to top up the pension plan AND the government bail out money went into the pension plan to help shore it up. Yes, the bail out money was NOT used to create jobs, it was NOT used to save jobs, the money went into the pension fund. We are currently in year 10 and the gm pension fund is 90.4% funded BUT that's only because of the government bail out money. This is why it's unclear if gm is still in the PBGF program. In one of my gm rants, i hinted to the members of this forum... look into the PBGF program. 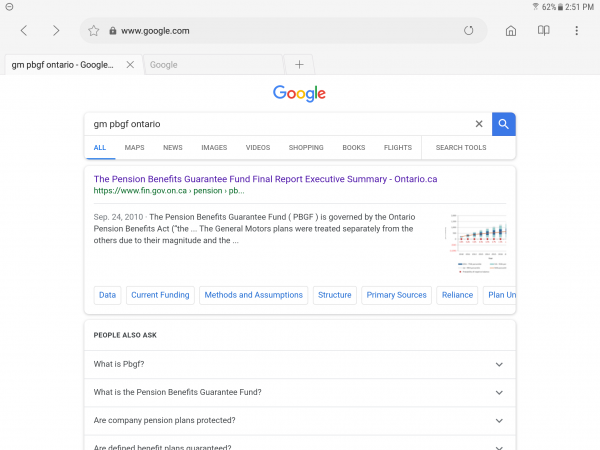 I believe i even attached a screen shot from 2010, showing that the administration of this fund were concerned over the potential cost to ontario, if gm defaulted on their pension obligations. Compared to another Ontario pension plan with which I am familiar, 90.4% funded is low. Normally, this would trigger serious remediation measures such as cutting benefits or increasing premiums. Meanwhile, GM stocks are up today. It's a sick system is all I can say. "The reorganization is estimated to save about $6 billion a year by the end of 2020, the company said." OF COURSE the stock is up, nothing sick about it - it's about efficiency in the market. My concern, as a Canadian taxpayer, is just how generous the slippery slope government in Ottawa is going to be, to laid-off workers, with the looming federal election next year? Just how much more of the burden are taxpayers being asked to bear? Trudeau didn't offer a compensation dollar figure, but in a video posted to YouTube, Marcel Groleau, president of Quebec's farmers' union, pegged the estimated loss of revenue for Canadian dairy farms from USMCA and previous trade deals at $480 million. Oh, yes, I knew I could count on a negative response from TIU and possibly others, but can't be intimidated by that sort of predictable lack of concern for those impacted by this decision. No, I'm not at all surprised that GM stock went up. It's a sick system. A more thorough discussion of the issue would require a different forum. Funny how people's perspectives are different, Loonie, my impression was the negativity was in your view of efficient markets being a "sick system" instead of, as Top It Up alludes, the system that has for hundreds of years every day brought increasing prosperity to humans the world over, like nothing before in human history. But if you'll allow me the last word I do agree that another forum is the place for a prolonged discussion about that. Re GM, it's doing what corporations are created to do: create wealth in the most efficient way possible in order to prevail against competitors, while at the same time adhering to the laws of the jurisdictions wherein it operates. I wonder if GM was hoping for some government money to keep the plant open. They got a big shot in the arm a decade back why not try a second time. They know Trudeau likes spending our money ie: pipeline, steel, and softwood. He didn't give Greyhound a handout thank goodness. A quebecers job is a precious thing indeed. Certainly a taxpaying quebecer job is! The provincial government of Ontario will cover under funded pensions for an amount “up to” $1500. Ontario does NOT cover all pension shortages for Ontario workers. And in regards to pension shortage the liberal government will turn their backs. At $1,500 per month, per retiree... the potential cost to the Ontario taxpayer is much larger than i stated. I know for a fact that gm were covered by PBGF but are they still covered by PBGF? This I do not know. Kind of funny. jerry dias (a man who loves to hear himself talk) hasn't mentioned the underfunded gm pension plan? Why is that? For peter's sake, i won't type a unifor rant. If they were I would not see that has changed. But not 1500 per retiree....up to 1500 per retiree. Ie. if the defined benefit pension is underfunded by 20% and a retiree is now short by $435 per month. PGBF covers that $435 only. If a retiree was under federal regulations like a truck driver in Ontario for a national company...that driver would NOT have coverage. 100’s of Sears retirees are now collecting it. It is very unfortunate for Ontario tax payers that the province of Ontario was not more forceful in ensuring pension plans were always in a topped up position. They set up a loose system and allowed pension shortages to fall back on the tax payers. GM is not leaving Canada though. They still have plants in Ingersoll and St. Catherines plus they are expanding their technology centre in Markham. There should be no need for concern at least for the foreseeable decade. As long as they have a corporate presence in Canada, they have legal and financial obligations. Ultimately, the 2500 jobs in Oshawa are a drop in the bucket to Ontario compared to the 100,000+ jobs lost in the oil industry out West. The gm plant in Ingersoll, is referred to as the cami plant. It was a joint venture with Suzuki and gm, they made the sidekick there. Though the plant is now solely owned by gm, it has NEVER been part of the big 3 collective agreement. Cami negotiate their very own contract, a year or two "after" gm canada, ford and Chrysler have reached their deal. The gm workers in oshawa believed merging with cami at contract time, would strengthen our bargaining power. The union (unifor) and gm believed differently. As for the brain trust in the tech centres, as far as i know...they are not unionized gm employees. I would call them "white collared" and most likely hired on a contract basis. Just like the Gm dealerships have nothing to do with our collective agreements. As for St Catherines, wow. They have been on the ropes for decades. Back in the early 90's i remember the Scarborough van plant having to hire bus loads of them, because of job cuts at st catherines. I agree, gm is not bankrupt BUT can or will our leadership go to Detroit and say... we need billions put into canada's pension plan? NO, they won't. I agree 2,500 in gm oshawa is a drop in the bucket. Gm canada has already lost. They had 2 fully operational car plants, named 1&2. This is where the 1,700 production workers are currently hanging out. 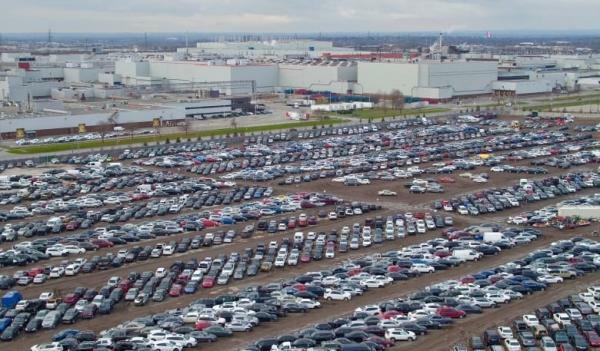 Over 10 million square feet for 1,700 production workers, makes oshawa the most inefficient plant gm has. No company in the world will survive sustaining a status quo in a rapidly changing environment, building cars no one wants or is buying. The days of the big 3 supplying multiple brands of dozens of models ended when they quit making Pontiacs and whatever else they quit producing. Ford has already announced they will only make trucks/SUV's and the Mustang, so look forward to more plants closing. The union and government can cry the sky is falling all they want (and I am a lifelong blue collar union member), but no one can force a company to stay open to preserve the jobs they think they are entitled to. Welcome to the club. Look forward to more new members in almost every aspect of society as the workforce transitions to intellectual instead of labor intensive mode as we become more technology dependent. That will be the robot uprising that will fundamentally affect the way we do everything from grocery shopping to transportation as people become more and more redundant as physical laborers. We are just too damn expensive to employ. What no one seems to want to acknowledge is that they are increasing their workforce in Canada for technology and development. US is losing more GM production jobs than Canada. I concur with AltaRed. Alberta lost way more jobs in in an industry that is a major contributor to Canada's economy and barely a peep from Ottawa, but lose .0001% of Canada's workforce in Ontario and it's the end of the world. If i may, i'd like to try to bring a smile to this forum before our entire Canadian economy implodes. Mentioning London locomotive above reminded me of an old hilarious (true) gm story. De Havilland used to be an aircraft manufacturer in canada located at Downsview. De Havilland owned a catapult. They used to test the integrity of an airplane windshield, by firing chickens at them. GM locomotive were fascinated by this idea and they asked... hey, can we borrow your catapult? The first chicken gm fired at the windshield of a locomotive, not only went through the glass, it almost went right through the entire cab of the train. GM was like WTF? GM called de havilland... something is wrong. De havilland asked, was the chicken frozen? De havilland replied... it's not supposed to be. The gm plant in Ingersoll, is referred to as the cami plant. It was a joint venture with Suzuki and gm, they made the sidekick there. Though the plant is now solely owned by gm, it has NEVER been part of the big 3 collective agreement. My post has nothing to do with the collective agreements (they can vapourize as far as I am concerned). As I understand it, pension plan legislation and obligations are tied to the corporate entity. As long as GM has a corporate presence in Canada and has assets, they have obligations to fund existing pension plans. Doesn't matter about union agreements, contractors vs employees, none of that stuff. BUT...what if that plant was it's own identity?